The fact that this set features star soloists � Los Romeros guitar quartet and Xavier de Maistre, solo harpist of the Vienna Philharmonic � illustrates that few corners are cut in that regard too. There are some definite highlights in terms of the music and performances contained within this set. The two featured concertos head the list for me. Both expand the repertoire for their solo instruments to good advantage for adventurous soloists. Indeed any repertoire for guitar quartet at all might not exist without the pioneering efforts of Los Romeros, and this work is no exception, as they document in the booklet.� The guitar concerto is rather strong in character from the start. Solo guitar lines are minimal, as the quartet weave textures amongst themselves throughout almost all of the four movements. Against this some forceful orchestral lines are contrasted; the quality of brass playing being impressive in fullness. The harp concerto shows a clear sense of the idyll � movement 1 - and nostalgia � movement 2 - in Madina�s writing. Xavier de Maistre�s playing occupies a subtle place within the whole, slightly recessed into the orchestral acoustic. The string playing, although often relying on violins in Bernad�s orchestration, is nuanced and flexible. 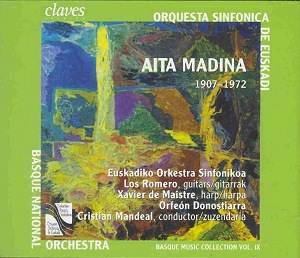 Distinct yet refined use of elements drawn from Basque music infuses much else of what is recorded here also. Throughout Madina�s concern for rich harmonics and orchestral texture is evident; that he deploys these elements with a sense of fun makes for an enjoyable listening experience. The Basque Rhapsody contains its fair share of punchily scored rhythms, which Mandeal seizes upon to bring out with flair in the performance. Some aspect of Madina�s fun-making imbues his works for children as well: the Children�s Overture rips along infectiously. The Christmas works take much of their basis from seasonal tunes orchestrated and elaborated beyond their humble origins. The Suite offers a briefer picture than the Triptych, which is wider in scope and greater in compositional ambition. Not that Madina�s smaller-scale works should be overlooked: Agur Maria carries a great sense of intimacy in the choral writing that is notable in the Orfe�n Donostiarra�s atmospheric performance.